The Global Volcanism Program has no activity reports for Kronotsky. The Global Volcanism Program has no Weekly Reports available for Kronotsky. The Global Volcanism Program has no Bulletin Reports available for Kronotsky. 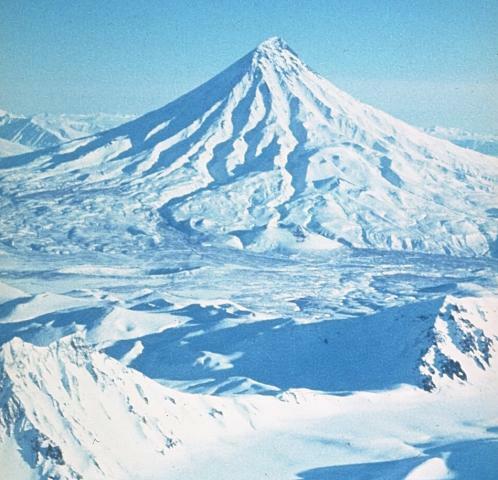 This symmetrical stratovolcano, one of the most scenic in Kamchatka, lies between the Pacific Ocean and Lake Kronotsky, Kamchatka's largest lake. The lake formed at the end of the Pleistocene and the beginning of the Holocene when extensive lava flows on the south side of Kronotsky volcano dammed the Listvenichnaya River. The flanks of the massive 3528-m-high volcano, one of the largest in Kamchatka, are dissected by radial valleys up to 200 m deep. A volcanic neck plugs the summit crater. Cinder cones are found on the north and primarily on the SE and SW flanks. Kronotsky lavas have been dominantly basaltic, with the exception of the small basaltic-andesite summit lava extrusion and a flank lava flow. Weak phreatic eruptions took place in the 20th century. 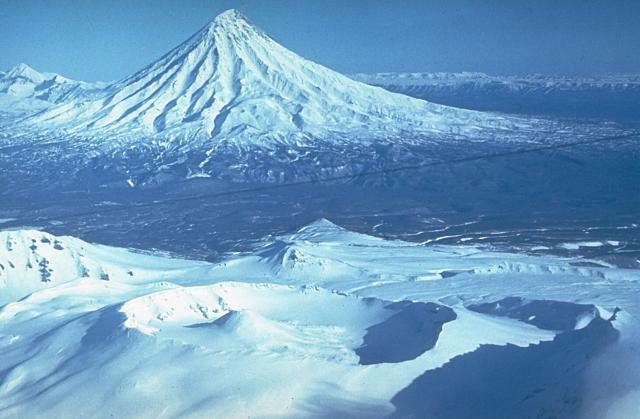 This volcano is located within the Volcanoes of Kamchatka, a UNESCO World Heritage property. Fedotov S A, Masurenkov Y P (eds), 1991. Active Volcanoes of Kamchatka. Moscow: Nauka Pub, 2 volumes. Kozhemyaka N N, 1995. Active volcanoes of Kamchatka: types and growth time of cones, total volumes of erupted material, productivity, and composition of rocks. Volc Seism, 16: 581-594 (English translation). Luchitsky I V (ed), 1974. History of the Development of Relief of Siberia and the Far East. Kamchatka, Kurile and Komander Islands. Moscow: Nauka Pub, 439 p (in Russian). Vlodavetz V I, Piip B I, 1959. Kamchatka and Continental Areas of Asia. Catalog of Active Volcanoes of the World and Solfatara Fields, Rome: IAVCEI, 8: 1-110. There is data available for 3 Holocene eruptive periods. There is no Deformation History data available for Kronotsky. There is no Emissions History data available for Kronotsky. 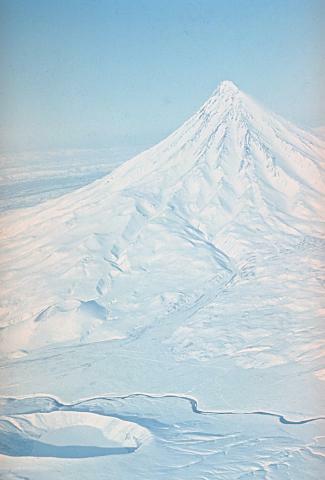 Sharp-peaked, conical Kronotsky volcano rises dramatically to the NE of the broad summit of Krasheninnikov volcano. The slopes of the largely Pleistocene Kronotsky volcano are cut by deep radial valleys. Weak phreatic eruptions took place during the 20th century. Krasheninnikov, in contrast, has had no historical eruptions, but has been active throughout the Holocene. The Northern cone (lower center) is truncated by an 800-m-wide summit crater that contains a lava cone formed during the last eruption, about 400 years ago. 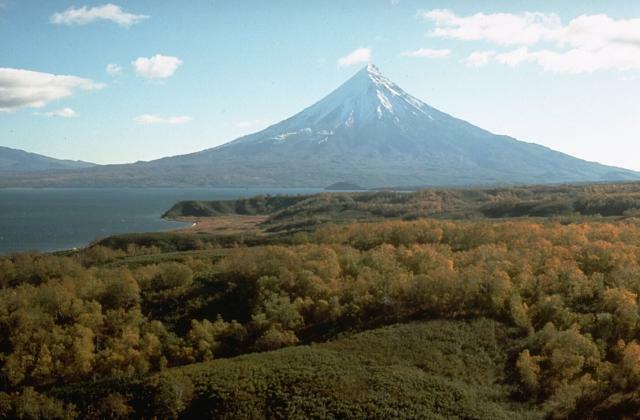 Conical Kronotsky volcano towers above Lake Kronotsky, Kamchatka's largest lake. The lake formed when a series of voluminous lava flows were erupted at the end of the Pleistocene and the beginning of the Holocene on the south side of Kronotsky volcano, damming the Listvenichnaya River. Cinder cones are found on the north and primarily on the SE and SW flanks of the radially dissected volcano. Weak phreatic eruptions took place during the 20th century. Photo by Dan Miller, 1990 (U.S. Geological Survey). Kronotsky stratovolcano rises NE of the Kronotsky River, which cuts across the bottom of the photo. A cinder cone above the river at the right is one of several on the SW flank of Kronotsky. The prominent circular crater at the lower right is a lake-filled maar that formed at the northern end of a rift zone extending 8-km NNE from Krasheninnikov volcano. The maar was erupted along the NE flank of a large Pleistocene caldera inside which Krasheninnikov volcano was constructed. Symmetrical Kronotsky stratovolcano, one of Kamchatka's most scenic volcanoes, lies between the Pacific Ocean and Lake Kronotsky, Kamchatka's largest lake. 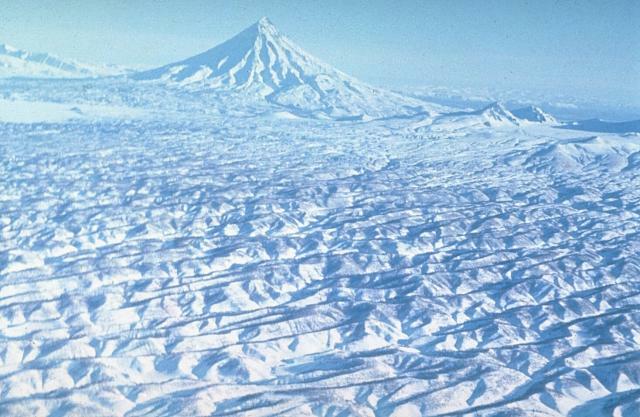 The flanks of the massive volcano, one of the largest in Kamchatka, are dissected by radial valleys up to 200 m deep. Weak phreatic eruptions took place during the 20th century. Kronotsky is seen here from the SW, with the caldera rim of neighboring Krasheninnikov volcano in the foreground. Kronotsky volcano, seen here from the SW, towers above a flat-lying, extensively dissected surface composed of eroded pyroclastic-flow deposits. These voluminous deposits were produced by massive Pleistocene explosive eruptions that resulted in formation of the calderas of Uzon and Krasheninnikov volcanoes. The initial caldera-forming eruption at Uzon dates back to the middle Pleistocene. A younger caldera that developed about 39,000 years ago was followed shortly by formation of the Krasheninnikov caldera. The flanks of steep-sided Kronotsky volcano are dissected by radial erosional valleys up to 200-m deep. The summit of the 3528-m-high stratovolcano, seen here from the north, consists of a basaltic-andesite lava extrusion. 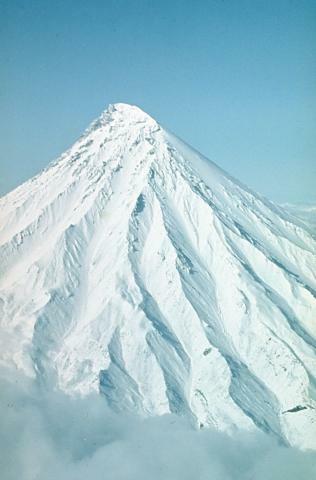 The conical, sharp-peaked volcano is one of the most distinctive in Kamchatka. Photo by Oleg Volynets (Institute of Volcanology, Petropavlovsk). There are no samples for Kronotsky in the Smithsonian's NMNH Department of Mineral Sciences Rock and Ore collection. IRIS seismic stations/networks Incorporated Research Institutions for Seismology (IRIS) Data Services map showing the location of seismic stations from all available networks (permanent or temporary) within a radius of 0.18° (about 20 km at mid-latitudes) from the given location of Kronotsky. Users can customize a variety of filters and options in the left panel. Note that if there are no stations are known the map will default to show the entire world with a "No data matched request" error notice. Large Eruptions of Kronotsky Information about large Quaternary eruptions (VEI >= 4) is cataloged in the Large Magnitude Explosive Volcanic Eruptions (LaMEVE) database of the Volcano Global Risk Identification and Analysis Project (VOGRIPA).